As the world’s sixth largest economy and provider of more than half the nation’s fruits, nuts, and vegetables, sustaining California’s vitality is paramount. And, with greater demands from a changing climate and growing population, taking a proactive approach to maintaining sustainable growth for California is critical. That is what Sustainable California, a new, media-rich web portal hosted by University of California Television (UCTV) is about. 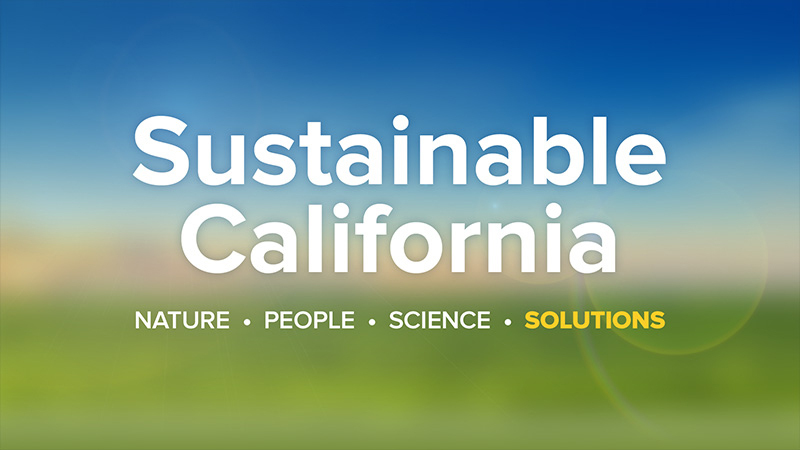 connects users to the science-based, real-world solutions the University of California is creating to maintain the balance of natural resources, biodiversity and sustainable growth in our state. Principal project partners include UC Water, UC Agriculture and Natural Resources, CITRIS and the Banatao Institute, the Sierra Nevada Research Institute and UC Merced School of Engineering among others. The launch features Water in the Balance, from UC Merced headquartered UCWater, a 5-minute journey from Sierra Nevada snowpack through the state’s system of dams to groundwater; Introduction to Conservation Agriculture Cropping Systems, from UC Agriculture and Natural Resources, featuring California farmers and UC scientists working together to develop sustainable farming practices and Sierra-Net, from Berkeley-headquartered CITRIS and the Banatao Institute, featuring the development of innovative cyber-infrastructure to provide real-time monitoring of the state’s water resources. The channel’s content is appropriate for audiences of all ages and freely accessible to the public online at uctv.tv/sustainable-cal. The integrated video, article and curriculum format of the channel, in addition to its focus on biodiversity, natural resources, and low-impact living, provides users both a look at and connection to practical solutions and approaches the UC is developing, making it a valuable resource for professional practitioners, educators, and media outlets.